LOUISVILLE, Ky. - On Thursday at Valhalla Golf Club, Englishman Lee Westwood shot his best score in the PGA Championship, a 6-under 65, which also happened to match his lowest score in any major. The round that began on the 10th hole included a double bogey on the par-4 1st, an oddity in an otherwise brilliant display. On an overcast morning outside of Louisville, Westwood collected nine birdies on his first trip around Valhalla and only needed 25 putts. "I played well all day," Westwood said. "I got off to a nice, steady start. Hit a lot of good shots. Hit a lot of fairways. Putted very nicely and just really carried on from the final round last week." Westwood shot a final-round 63 at last week's WGC-Bridgestone Invitational. He arrived at Valhalla feeling good about his game. "That obviously gave me some confidence coming into this week," he said. "Just tried to sort of almost take it easy in the practice rounds. Played nine holes each day. Didn't want to drain myself, especially with the heat." Except for the Englishman's game, it wasn't too hot today at Valhalla, with temperatures in the low 80s due to cloud cover. Rain is in the forecast, which could send scores lower. Kevin Chappell, who said, "I guess I was in a good rhythm out there," also posted a 65. Chappell, 28, a UCLA product, is playing in his second PGA Championship. Last year he missed the cut at Oak Hill. His first round at Valhalla included six birdies and no bogeys. "I think if you're driving it long and straight, any course plays to your game," Chappell said, "and that's the key to this golf course ... getting the ball in play and being able to attack these short holes." Ryan Palmer, who was part of the afternoon wave, also finished with a 65. After an opening 3-over 74, Tiger Woods has some work to do if he wants to play on the weekend. A "dialed in" golf swing on the range went missing during his first round. "Unfortunately, I didn't carry it to the golf course," Woods said. Tiger also struggled with his speed on Valhalla's putting surfaces. "I didn't get a putt to the hole." Paired with Tiger, Phil Mickelson started poorly but finished strong, playing the last 10 holes in 4 under par. "It's been a while since I felt like my game was to this point," Mickelson said after his 69. Players are still on the golf course, including Rory McIlroy, who is at 4 under on the 16th hole. Defending champion Jason Dufner pulled out after 10 holes because of neck problems. Dufner was 8 over par. "I've been feeling pretty bad all week," Dufner said. "I felt bad last week. I haven't made a birdie in 45 holes and I'm just not able to play golf right now. I tried to do what I could to be able to compete some and give it a go, but it is just pointless." Like I posted yesterday, Tiger Woods' priority should be to get healthy. He is clearly not healthy despite his protestations. Think how delusional & ego drunk you have to be, to show up at the PGA with a broken swing & sick body thinking you can compete with the best golfers. It's pitiful to watch this once spectacular player fumbling around the gold course. Evander Holyfield anyone ?? You would think that someone in his camp has the decency to inform the guy, he needs to be healthy to compete. And it's not something he can accomplish in 4days or 2months. 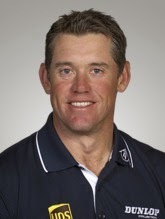 Think how much good Tom Watson can do for this guy by not picking him for the Ryder cup.